We’ve called this basket “Smoothness and bubbles” as we wanted to create a pack that transmits both qualities. It’s the perfect gift for those we love, as it’s crammed with affection and something special for the senses. Sophistication and sparkle come in the form of the bottle of Freixenet Excelencia Brut cava, which will delight even the most demanding palate and is the perfect way to add a touch of joy to that special moment. The chocolates… well, they had to be Lindt! 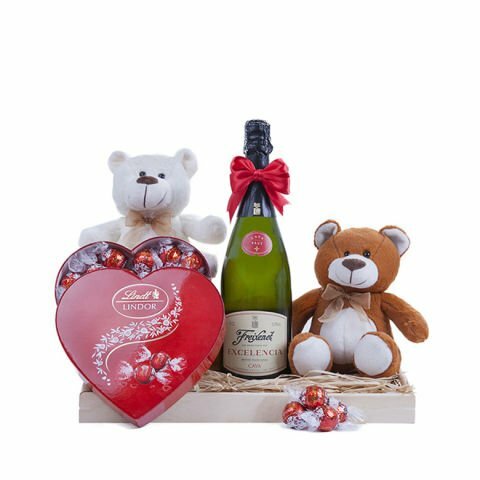 The unmistakable flavour of Swiss chocolate makes a marvellous match for the sweetness of the teddy bears and the touch of cava. There are so many reasons to give a present, to lavish affection, offer, reward… A basket is always a great choice as it means we can combine a range of those things our nearest and dearest like most. And this basket includes a good cava, some special chocolates and sweet teddy bears.